The guys turned up on time and did an outstanding job moving our stuff from storage into our new home. They were polite, helpful, careful and importantly when time is money, fast. They worked tirelessly and had the job done with zero damage in no time flat. I’ve used another cheaper by the hour company and it was a nightmare. Damaged furniture, furniture left behind, too small a truck, overall way more expensive and stressful. 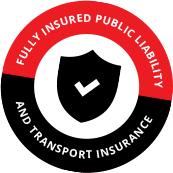 Go with Kieran’s guys it’s the best value around as they combine experience with completely reasonable cost. Thanks again Man With A Truck. Called Man with a Truck on late notice and organised a removal for a friend with ease and no fuss. The two guys who arrived at 1pm Alex and Brad were friendly and enthusiastic to get started even though they had just finished a move for another customer. This move was not your usual move. There were two very large bird houses, Hen houses, Animal crates and of cause all the inside and outside furniture. The guys had a huge job and were extremely good at playing Tetrus with Furniture in the truck moving everything around so it would fit with great care. They didn’t stop working and this move took over 9hrs (this was due to the amount of things to be moved not the travel time). I was extremely impressed with them and didn’t feel like i needed to keep an eye on them!!! I cannot recommend them highly enough. After shopping around decided to go with Man with a Truck. These guys were great – on time, on point, careful and professional. Matt and Mareca were able to work around the chaos of a family of six. 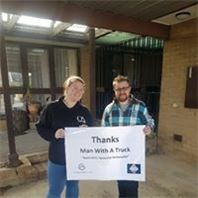 With four flat out kids wanting to be involved in our move Matt and Mareca always had a smile and a good word – nothing was a problem and anything that looked tricky they solved without any fuss. Not even the rain put a dampener on the morning’s move of our three bedroom house. 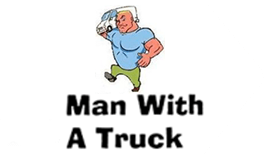 I will definitely be recommending Man with a Truck to my friends and colleagues – on price, on performance, on point – these guys are the pick of the bunch – thanks for taking the stress out of our big move ! We look forward to moving with you again in December. Man With A Truck I am truly grateful to Kieran and his team with their expertise in making light work of a tough job. I asked for a quote to shift some couches and explained the risk that the couch may have been too big for the lift so would have to be manouvered up to the eight level of an apartment block. No surcharge on the quote for stairs and just pay by the hour! Man With A Truck showed up clearly knew their stuff as they managed to get a huge couch in a too small lift with barely breathing room to spare. I had been stressing about shifting these couches and had received huge quotes and criticism from other removalists. Nothing was too hard for Kieran and all at a great price. He is clearly a can-do guy. Really happy with all their help and highly recommend for the amazing service. 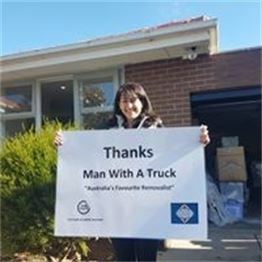 After getting a few quotes from different removalists, I decided to give Man with a Truck a go and it was a great decision. They where fast, very efficient,careful with all the items and happy to talk to. I will definitely recommend them and on top of all that, they where the cheapest out of the 4-5 quotes I received. Job well done Man With A Truck! Sam and Giovanni helped us moved our three bedroom house with lots of sports equipment safely and quickly. 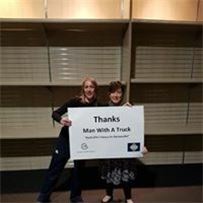 I highly recommend Man With A Truck for your moving! I called Man With A Truck on a Friday because I had a terrible experience with a cheap mover. Booked them for Tuesday. Great guys – great price – experienced and showed real care with my things.